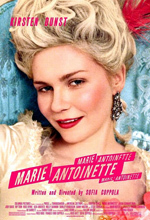 What did you think of Marie Antoinette? Lost in Translation, for all of its critical acclaim, was admittedly a love-it-or-hate-it affair. I was fond of the film (even if it was a tad overrated) and while I liked its quiet charms, I can fully appreciate how others might find it completely boring. Writer-director Sofia Coppola dared to be muted, quirky and elliptical, and as a result people either embraced her for it (particularly for contrasting her father’s bombastic auteur style) or scratched their heads and asked, “What was the point?” My reason for beginning a review of Marie Antoinette by talking about Coppola’s last film is because in many ways it follows the same template: a young girl finds herself in a strange land, isolated by cultural difference as she struggles to figure out who she is. The only difference here is the girl in question is the soon-to-be queen of France in the late 18th century. Marie Antoinette was notoriously booed when it premiered at the Cannes film festival earlier this year, and after seeing the film, I can’t say I’m surprised. Some found Coppola’s portrayal of the Japanese in Lost in Translation to be grinning and bowing stereotypes. Whether that is fair or not, the French fare even worse in Marie Antoinette. Indeed, the first part of the film depicts Marie’s chilly reception by the French when she arrives from Austria for her arranged marriage with Louis XVI (Jason Schwartzman). Gallic controversy aside, it does create one of the few bits of genuine tension in this long, meandering film. Whether you think she was a vapid, spoiled twit or a misunderstood proto-feminist, Marie Antoinette had a hell of a life. The last five years of that life in particular are rife with political intrigue and personal heartache—not that you’d know it from watching Coppola’s arid, static interpretation of it. The film has absolutely no story and takes its time not telling it. I’d like to send a memo to directors like Coppola and Michael Mann who love endless shots of people walking down hallways and staring out windows: atmosphere does not equal drama. The film lingers endlessly (and I do mean endlessly) on Marie’s coming of age and then hops, skips and jumps awkwardly to the end of her life. To call the ending a letdown might make me seem like some lurid gore-monger, but the film seems to deliberately sidestep history in favor of character study—a gamble that never pays off. Kirsten Dunst is ideal for the lead and tries her best, but she is stifled again and again by a script that goes nowhere. Despite being the central character, she has precious little dialogue (she does not utter a single word for the first twenty or thirty minutes of the film, despite being in virtually every scene). Schwartzman seems way too contemporary to be convincing as an 18th century king (even if he is supposed to be a schlub). Like Dunst, he retains his flat American accent while his costars show up with varying British and pseudo-French inflections. There seems to be no purpose in this choice, just as there is little purpose in the supporting cast (which includes an over-the-top Judy Davis and a what-is-she-doing-here Molly Shannon). Perhaps the greatest moment of Marie Antoinette is the opening shot. I won’t spoil it, but suffice to say it’s a “F*** You,” in-your-face meta moment that promises to re-envision its title heroine as an 18th century rock star. It’s all the more disappointing that the rest of the movie doesn’t fulfill the potential of that opening moment. The modern rock soundtrack isn’t terribly distracting, but it does nothing at all for the movie. Furthermore, in the midst of all of Coppola’s hippy-dippy wanderings, the film occasionally tries to play it straight as a period piece and the results are laughably stiff and awkward. In trying to get inside the mind of the world’s most famous cake lover, Marie Antoinette instead makes her feel more remote and indecipherable than ever.